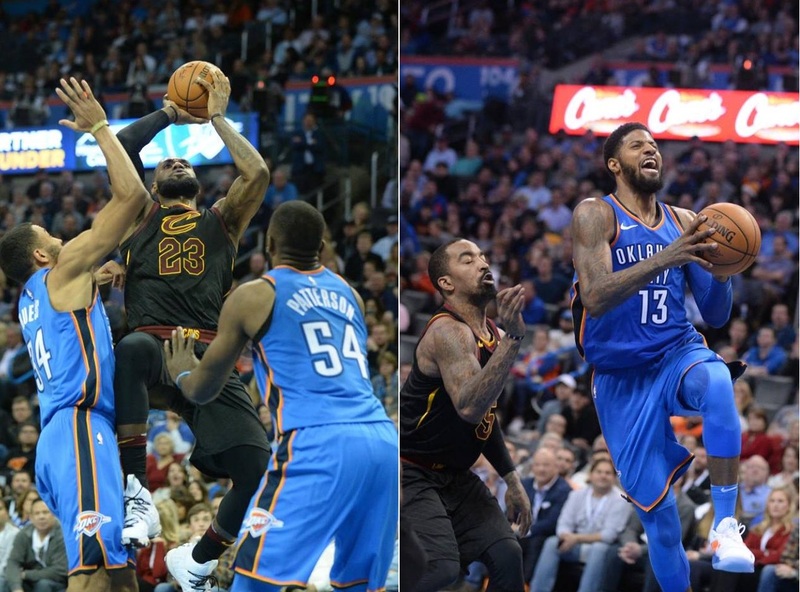 NBA – The Cleveland Cavaliers are now in 4 – game winning streak after defeating the Oklahoma City Thunder 120 – 112 at the Chesapeake Energy Arena in Oklahoma City, Oklahoma. Cavs now even the season match-up against the Thunder after avenging their humiliating loss from their first meeting. The win improves Cavaliers standing in the East at 34 wins and 22 losses the 3rd best record in the Eastern Conference. Cavs superstar and rejuvenated LeBron James drops game high 37 points, 8 rebounds and 8 assist, exploding in the 3rd quarter after scoring 15 straights point out of 17 points in the 3rd keeping the Thunder away from the game. JR Smith also added 18 points in another good shooting night with 6 out of 9 three’s, while newly added faces from the Cavaliers trade Jordan Clarkson and Rodney Hood added another double digit points in their 2nd game in Cavs uniform with 14 points apiece while Larry Nance JR added 13 points and 1 rebound away from a double-double game. George Hill also added 7 points and 4 assists while veteran Jeff Green drops 10 points. Meanwhile, OKC big four had an impressive and balance game, especially Steve Adams, who had a monster game from start to finish with 24 points and 17 rebounds, Paul, George drops 25 points to lead all scorers for the OKC, while Carmelo Anthony has added 24 points, reigning MVP Russell Westbrook has 21 points, 12 assist and 7 rebounds but not enough to beat the rejuvenated Cavaliers. The new look Cavs has now won 3 straight road games, where in their last two games they beat legitimate tough teams.They destroy the Celtics in their home at TD Garden and the latest are the Thunder. With this win it surely legitimize the Cavaliers as the best team in the East? And the rightful contender to face the defending champion Golden State Warriors for the 4th consecutive Finals match but the million dollar question is "If they had the tools to beat the Warriors? No Comment to " OKC Big 4 not enough to Beat LeBron James and the New Look Cavs "